LOT3 is a professional development initiative funded by the European Commission (EuropeAid/126931/D/SER/ER) with B&S Europe and EUCLID / Euclid Consortium acting in a partnership to manage this complex program. LOT3 aims at upgrading the skills of 60 Ministry of Education teachers and officials to BEd and MEd level. 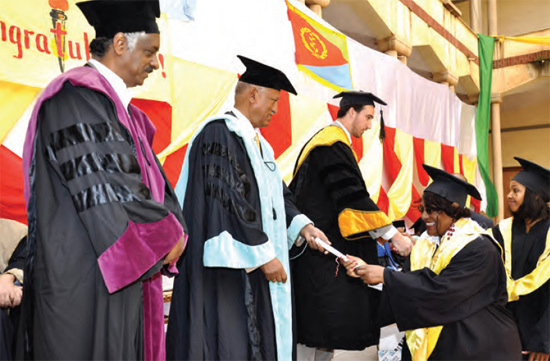 It was launched in February 2009 by a EUCLID delegation led by Ambassador Banny DeBrum in the presence of Eritrea's Minister of Education Semere Russom and in cooperation with senior MOE staff. The LOT3 graduation ceremony took place on August 16, 2012 in the presence of H.E. Minister Semere Russom, Minister of Education of the State of Eritrea (photo below). EUCLID also trains other government staff in Eritrea, notably for the Ministry of Foreign Affairs.